The Northwest includes Idaho, Oregon, Washington, and Alaska. Melting glaciers and warming ocean waters won’t just hurt polar bears. Productive oceans and streams, verdant forests, fertile soils, and key geologic formations allow the Pacific Northwest to provide an abundance of natural resources and energy for the rest of the country. Terrestrially, the economic productivity of the region is now at risk due to changes in the timing and magnitude of freshwater snowmelt, which is linked to $17 billion in food production. Increasing temperatures have already impacted the migration patterns of the economically important sockeye salmon in the Columbia River, and certain trout species will likely decline by nearly 50% in the coming decades. In the Pacific Ocean, warmer temperatures and acidification may be linked to toxic algae blooms and incidences of shellfish poisoning, damaging fishing and recreational opportunities. Population growth and increasing resource consumption throughout the US will continue to drive development for oil and gas extraction in increasingly sensitive terrestrial and offshore ecosystems. 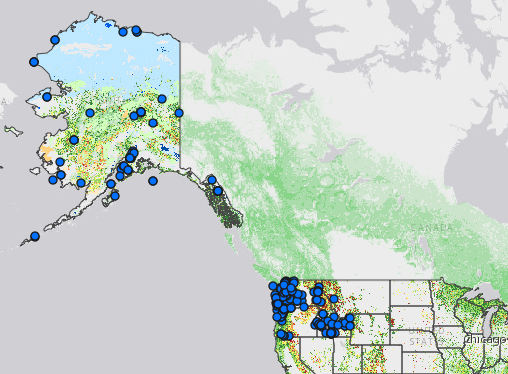 The consequences of global change are particularly pronounced for indigenous populations, and 229 federally recognized tribes (40% of all tribes in the US) inhabit Alaska and constitute the demographic majority in many rural areas. Declining and migrating wildlife populations in combination with melting sea ice and permafrost undercut the traditional hunting and fishing practices used by Alaska Native Peoples, whose traditional ecological knowledge has recorded ecological changes across generations. Forests are being decimated due to increasing frequency and intensity of wildfires coupled with outbreaks of the pine bark beetle, spruce budworm, and tent caterpillars. The ecologically important inland sagebrush grassland, known as the “sagebrush sea”, is threatened by the invasive cheatgrass, expansion of oil and gas drilling, and ranching and grazing on public lands. Debates over the listing and management of endangered species continue to rage in this region. The ecosystem is home to the Greater and Gunnison Sage Grouse species, two charismatic birds with highly unique behaviors. Expanding Gray Wolf populations recolonizing their native range in Idaho and Oregon have been killed by hunters, and are viewed as a threat by many ranchers. These distinctive species and ecosystems of the Pacific Northwest also draw visitors from all over the world, and their disappearance could damage economic opportunities in neighboring communities.